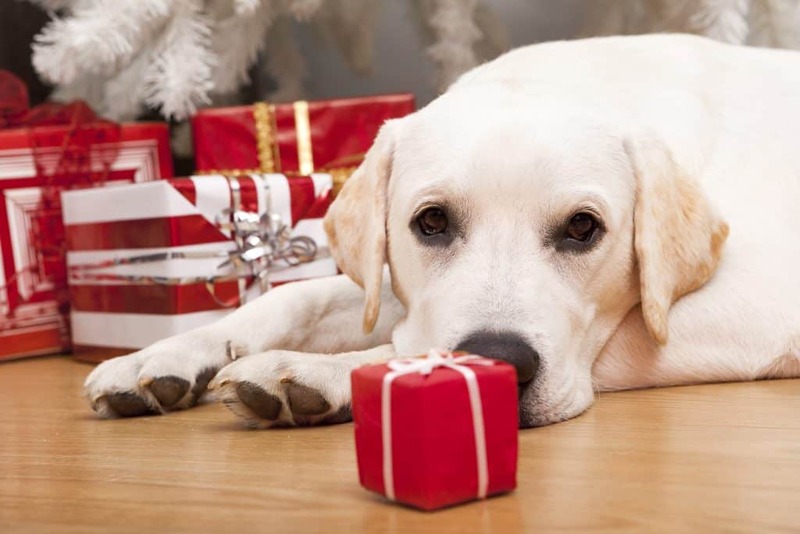 Even if you’re on a tight budget, you can add your furry friends to your gift list. 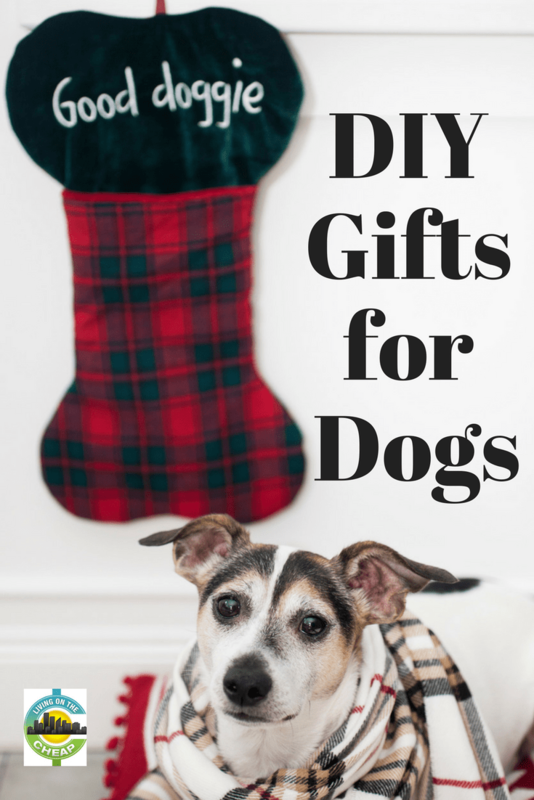 Presents for dogs and cats are inexpensive and super simple. Some are easily pulled together from items that are already in the house. If you prefer somethingt more gourmet, pull out the baking supplies and whip up some healthy homemade dog treats. A recipe for Bowser Biscuits is featured on the website for the Humane Society of the United States. The mix includes, among other items, a banana, peanut butter, soy milk and whole wheat flour. Bake on a lightly greased cookie sheet for 40 minutes. Turn off the oven and let them cool overnight. If you and your dog can’t wait that long, cool them completely on a wire rack before serving. Instead of cutting out more shapes with the left over peanut butter and oatmeal dough, I rolled it into balls. Then I made a cross hatch fork mark on the dog cookies. (This is the same technique I use making cookies for humans.) 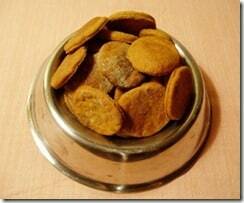 After: The cookies get very hard, just the way dogs like them! Kitties are terrific at repurposing. So many items that seem ordinary — even trash to us — are exhilarating for cats. That offers potential for budget-friendly gifts. 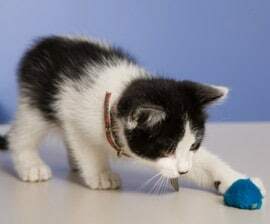 Cat toy suggestions from the Humane Society of the United States include round plastic shower curtain rings, ping pong balls (perhaps tossed into a dry bathtub), paper bags without handles and tubes from paper towel rolls. Another idea is to fasten a few cardboard boxes into a home-made kitty condo. Cut out sections for windows and doors. For decoration, add the cats’ names or other embellishments. Tie little bell balls to string, or several strings, for a swinging musical toy that dangles from a doorknob, suggests Susan Hargreaves, founder of Humane Educators Reaching Out and Animal Hero Kids. Another simple gift idea is to line old shoeboxes with soft layers of old towels to create small cozy beds. For larger cats, use larger boxes. Old socks are a good starting point for DIY dog toys. Remember, if you’re going to introduce a dog to the idea that socks are toys, it’s going to be your responsibility to keep “good” socks out of the pup’s reach, according to Ben of the Santa Fe Animal Shelter. Dogs shouldn’t be expected to know the difference between humans’ favorite socks and the well-worn pair that’s acceptable for play. 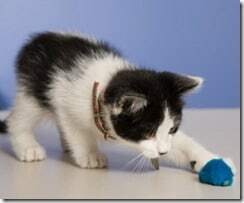 For a sock toy, Ben suggests inserting an empty plastic water bottle into a sock. Tie the top of the sock into a secure knot. Lots of dogs enjoy the crunching noise of the water bottle. A similar variation is a tennis ball or two tossed in a sock, with the top tied. The toy works nicely for toss and fetch games. As with most toys, it’s always wise to supervise play. Remove and discard toys if a dog is gnawing through the items and possibly ingesting bits of fabric or plastic. Select a nice activity for you and the pet to enjoy together, then create and print out a gift voucher. A dog walk or extra excursion to a dog park might be perfect for a pooch that’s part of a neighbor’s or friend’s family. If you’re so inclined, offer a dog bath. Or petsitting for a pal’s cat. For youngsters designing gift vouchers for their own pets, encourage them to think about what their animals enjoy. Surely lots of kitties would happily cash in vouchers that offer rubbing behind the ears. 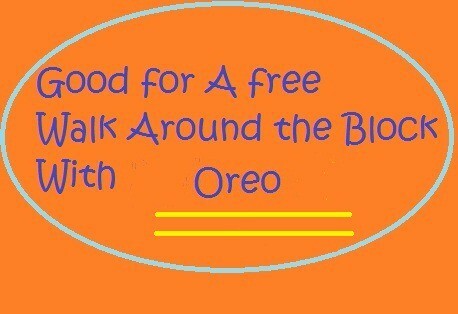 Warning: Even if the pet eats the voucher, you should still provide the treat.